and to protect your abode and your investment in it by enhancing its quality, durability, and appeal. The last point sounds dry and markety but really, it’s about an ounce of prevention is worth a pound of cure; and the more long-range the decisions you make about your home, the more you are likely to love it, the more hospitable it will be, and the better its intrinsic and emotional value in the long run. Because people want to live in a place that is not only green, but unique, considered, and loved. Reinsulation of an inadequately sealed storage room, to help with what I would call extreme coldness of the room above the storage room. Without heating these rooms, temperatures in January tended to be 4-6ºC in the storage room, and 10-14ºC in the bedroom above. The two other unheated bedrooms were a balmy 16ºC, which is good enough for sleeping. This effort finished this week! However, the basic photo of the “after” has only one difference than what would have been before: the wall to the right, a fire wall (mur mitoyen), is now covered and insulated all the way. The far end is the knee wall facing the attic of the garage: pretty much uninsulated, no vapour barrier or sealing: now corrected. 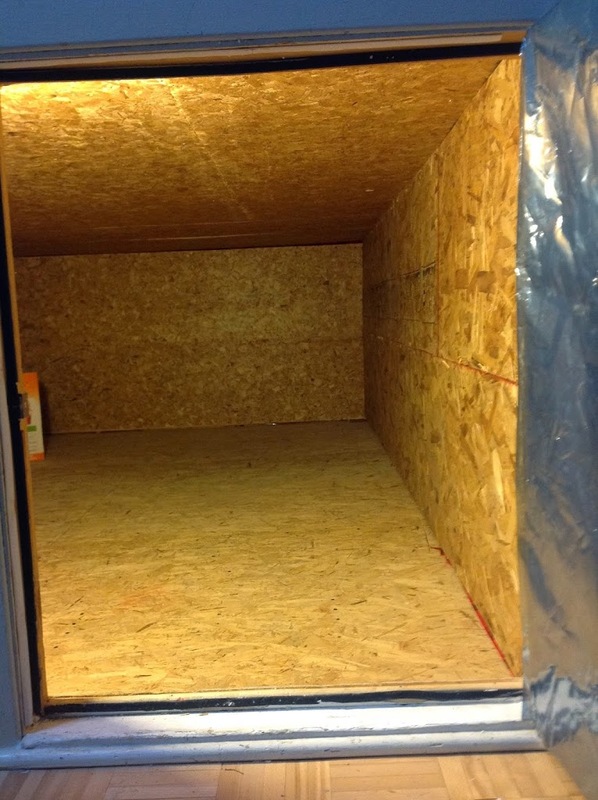 The floor was filled with blown insulation, and the other walls insulated with pink rigid styrofoam, vapour barrier, and covered. Presently, being spring and getting ready to plant the garden, the driveway renovation is the going concern. And that is going to be a treat, as I have wanted to convert my driveway to a green driveway almost since the beginning, scoping out the project five years ago. It’ll be done in April and I’m looking forward to that! Sugar ants aren’t pests – they’re helpful!